AVnu Alliance has prepared an education seminar for Integrated Systems Europe (ISE) 2016. The half-day education training will be hosted at the RAI the day before the ISE show floor opens. AVnu Alliance is an official InfoComm International Renewal Unit (RU) Provider for the training event. AVnu Alliance members will also provide expanded education with a series of presentations and a Master Class taking place during the ISE show program. Titled "Next Generation AV Network Fundamentals and Design”, the education training day is planned for February 8, 2016 from 12:30 p.m. to 5:00 p.m. CET at the Amsterdam RAI in room G107. AVnu Alliance members and experts will overview the evolution of Ethernet and delve into how Pro AV applications can take advantage of these new capabilities. The half-day training program consists of three segments starting with an introduction to the principles of digital networking and IP/Ethernet, including an overview and mapping of protocols. Following the introduction, presenters will focus on Network Topology to explain end-user installation and configuration considerations. The final third of the day will cover AV solutions backed by installation and Audio Video Bridging/Time Sensitive Networking (AVB/TSN) system architecture examples. 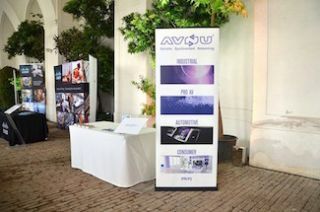 Attendees will be given a demonstration of Axon Digital Design's Ethernet AVB/TSN network backbone for broadcast video. The training will be presented by Steve Carlson, a veteran in the field of networked systems and standards, along with AVnu members including Christian Diehl, product manager for Intercom Systems with Riedel Communications. Guests are encouraged to attend a cocktail networking hour open to the public directly after the final education session. The session is free and attendees qualify for 3 RU Credits. Register here to attend the free session. "AVnu Alliance has shown a commitment to bettering the audiovisual industry through the delivery of quality training that supports accreditation," said David Labuskes, CTS, RCDD, executive director and CEO, InfoComm International. "By fostering professional development, the Alliance has demonstrated its leadership and strong support of the industry."